First Kiss Friday with Sherry Ewing & a Giveaway! It’s First Kiss Friday and today I’m featuring… well… myself and Home For The Holidays… just in time for Christmas. Read on for the first kiss scene for Margaret & Frederick from Under The Mistletoe along with how to enter for your chance to win my giveaway! Heading into the foyer, Margaret asked for her cloak and Frederick assisted her with donning the garment. He went to the door and opened it wide with his hand extended towards her. “Walk with me,” Frederick urged. She took his gloved hand without hesitation. In truth, she would follow him to the ends of the earth, if she must, just to be with him. 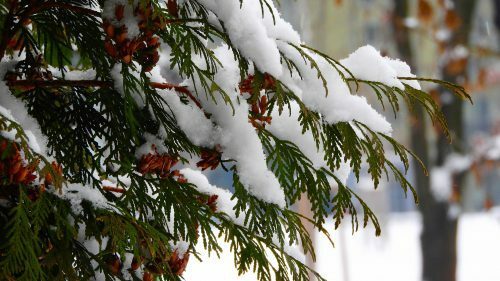 The snow crunched beneath their feet as he escorted her towards the back of the house and into the nearby trees that would surely offer them a few moments of privacy. Once they were far enough away from prying eyes, Frederick pulled her into his arms. She had never been this close to him, or any other man for that matter, not since those happy years long ago when they were but children tumbling down a grassy hill as they played. Her shiver had nothing to do with the weather. “I believe you owe me a kiss, sweet Margaret,” Frederick whispered in a husky, seductive tone that set her soul to flight. Her hands made their way to rest upon his chest, and she fingered the lapels of his coat. “I promised you no such thing.” She laughed lightly. “It is tradition, after all, when you stand under the mistletoe, my dearest,” he said with a roguish grin. Any answer she could have given him was cut off as his mouth lowered to hers. Soft lips touched her own, and her breath hitched at their contact. She took a small step forward, and he deepened their kiss even while his arms tightened around. With her heart beating a rapid staccato with his nearness, Margaret’s mind swirled in a dizzying haze while she lost herself in this moment. Her first kiss. Everything in her world seemed to right itself in this one instant in time, and, for once, her life became balanced. If Margaret had known his kisses would render her senseless, she would have never refused his original offer. They had lost years where they could have been together, perhaps even already having a family of their very own, and it was all her fault. He must have sensed where her thoughts had led her for he ended their kiss abruptly but continued to hold her close to his heart. “Promise me you shall become my wife,” he murmured against her hair. The holidays are upon us and there’s nothing like curling up with the gift of a good Christmas book. Enjoy this Regency box set with two of Sherry Ewing’s previously released holiday novellas, A Kiss For Charity & Under The Mistletoe! A Kiss For Charity – Young widow, Grace, Lady de Courtenay, has no idea how a close encounter with a rake at a masquerade ball would make her yearn for love again. Lord Nicholas Lacey is captivated by a lovely young woman he encounters at a masquerade. Considering the company she keeps, she might be interested in becoming his mistress. From the darkened paths of Vauxhall Gardens to a countryside estate called Hollystone Hall, Nicholas and Grace must set aside their differences in order to let love into their hearts. 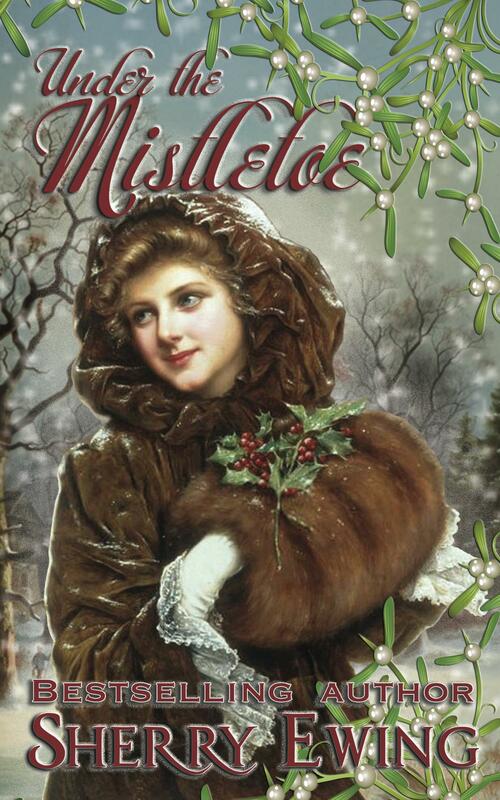 Under The Mistletoe – When Margaret Templeton is requested to act as hostess at Captain Sander Morledge’s Christmas party and possibly agree to marry him, she did not think she would see the man who once held her heart. Frederick Maddock, Viscount Beacham had never forgotten the young woman he had fallen in love with, and his feelings are evident when he sees her at a holiday gathering. In a swirl of Christmas miracles and joyous celebration, will the two finally put down their differences and once again fall in love? 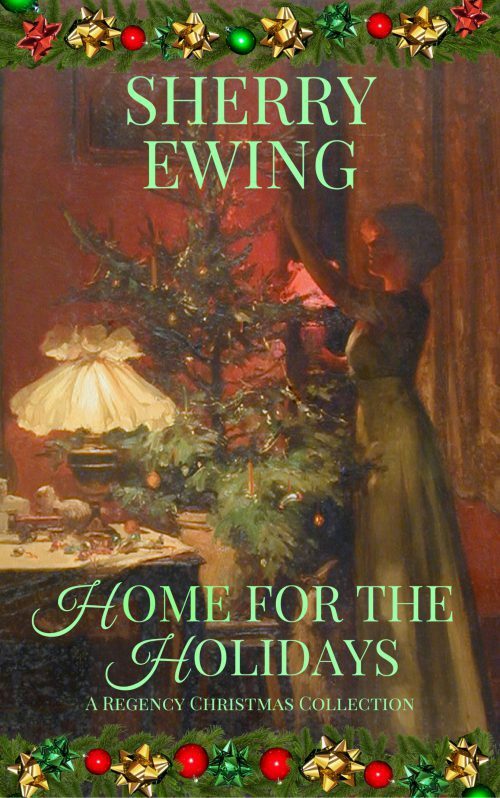 For a chance to win an eCopy of Under The Mistletoe that is found in Home For The Holidays, leave me a comment telling me something you enjoy during the holiday season. I’ll leave this giveaway open through Christmas before I generate a random comment on Tuesday as the winner. Good luck! I’m looking forward to seeing my son after two years! Merry Christmas, Patti! I enjoy baking Christmas cookies with my kids. Watching them decorate the cookies. I enjoy seeing my family get together at my mom’s Christmas day for dinner and seeing what Santa put under the tree. Something I enjoy during the Holiday Season is sharing holiday happiness by giving. One year it was giving boxes of chocolates to the toll booth operators while we were heading home for the holidays. (The look on their faces was priceless!) We also purchase fruit to donate to our Church for Christmas gift bags that are given out to the children after the Song Service. Making trays of cookies and homemade goodies for the neighbors and/or helping them shovel out their driveway. I enjoy cooking and baking. I also enjoy family get together. My mom has a snack table at her house just waiting for us! Happy Holidays, Faye. Hey Sherry, I enjoy spending time with my family. I have two great nephews 3 & 2 and they are just fun to be around. Also making goodies to give! I miss having little ones around! Thanks for stopping by, Lori, and happy holidays! When we were little my dad was usually out of work but he would drive us around to see all the Christmas lights and displays then come home and have hot chocolate. When my dad got older and was going blind we took him around. Now my daughter and I go around trying to see what my dad would have thought of the displays. Such good memories! I enjoy wrapping gifts and seeing the little ones, great-granchildren, eyes sparkle with delight when trying to figure out what is inside. I also love baking at this time of year-cookies, breads, pies. I just enjoy the season so very much. Merry Christmas. I miss my grandmothers baking. I still have a glass of wine and give her a toast when I cook her favorite foods. Thanks for sharing, Donna, and happy holidays! I love it all, the music, the smell of the tree, the sweet treats, spending time with family, finding special gifts for my family. During the holiday season I enjoy several things: Christmas music, wearing my holiday clothes and socks, my Christmas jewelry. It’s one of my favorite times of the year. Christmas jewelry is so much fun! Thanks for stopping by, CG! I enjoy getting together with family. I agree, Michele. I’m enjoying time visiting with my family as we speak! Happy holidays! I enjoy the Christmas decorations, especially the luminarias here in New Mexico on Christmas Eve. How lovely, Beverly. Merry Christmas! Thank you for letting us know about .99 cents..and ordered it. Thank you for letting us know about the .99 and I ordered it. Happy Holidays! Thanks for picking it up and happy holidays! I like buying gifts for friends and family. There is something satisfying and pleasurable in finding the perfect gift for someone. Listening to Christmas songs and searching neighborhoods with Christmas lights. It’s the best! Happy holidays, Kai! My Christmas socks! I have enough to wear a different pair each day from the day after Thanksgiving thru Christmas day. I also love decorating with my husband, our Yoda tree topper and eggnog lattes. I really just enjoy celebrating the real reason for the season, the birth of my Lord and Savior, Jesus Christ. We enjoy looking at the light displays and I do enjoy eating Christmas treats! Thank you and have a Merry Christmas! I love to ride around at night and look at the Christmas light displays on homes. I love doing this too or even walking around the neighborhoods. Thanks for stopping by and leaving a comment, Pat. I love all the Christmas lights and decorations but more so the feelings of goodwill that are evident when out and about. I just wish this sentiment could last all year. I look forward all year to all the Christmas goodies! I do too! Merry Christmas and thanks for leaving a comment! Merry Christmas to you as well, and you are welcome! Sounds wonderful, Tikey. Merry Christmas! Thank you to everyone who participated on this giveaway that is now closed. The random comment chosen as the winner is Luz. Please email me at sherry@sherryewing.com so I can confirm your information to get you the eCopy of Under the Mistletoe. Happy holidays everyone!